Amenities: The Indoor Pool features a 6-lane, 25 yard lap pool which converts to a wave pool; whirlpool spa; beach style entry, kids pool with fountains and spouts; and an indoor flume slide. 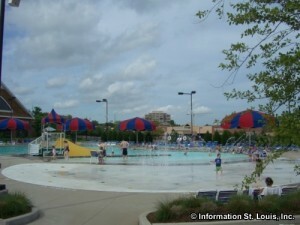 The Outdoor Pool has two pools. The lower pool features a large open play area, zero depth entry, and a slide. The upper pool features a lazy river, whirlpool, 75-foot speed slide, a flume, a children's pool with fountains, spays and more. There is a large sunning area and a cafe.